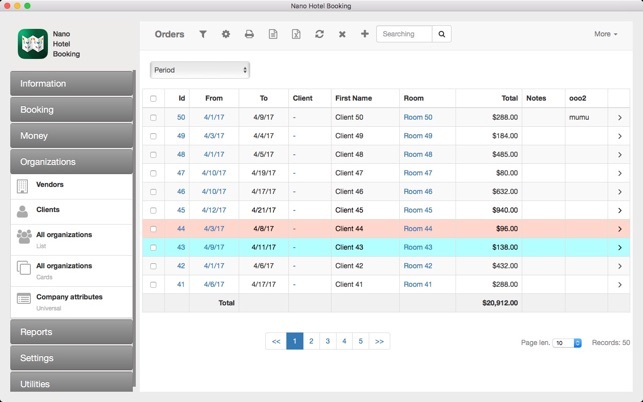 Nano Hotel Booking - is an application for receiving orders and booking rooms in hotels, recreation centers, health centers, guesthouses. Also, it can be used for daily, hourly, weekly, monthly, quarterly and yearly renting of real estate, vehicles, construction machinery and any other objects. Application’s versatility makes it suitable for services reservation, for example, at hair salons, car workshops, gyms etc. The program is fully compatible with the mobile version (Nano Hotel Booking for iOS). 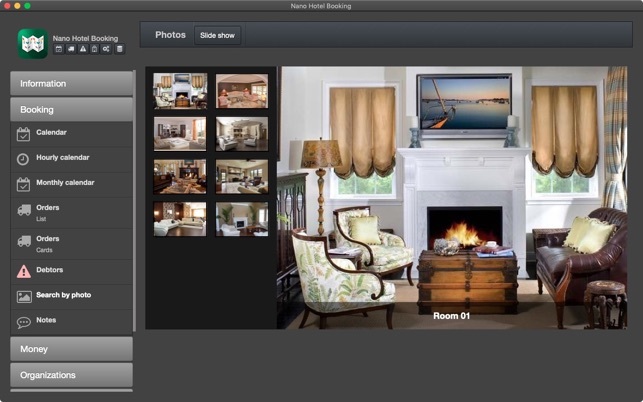 The application is based on a calendar registering the statuses of the hotel rooms (objects). The calendar displays the state of a hotel room on any day of the month. In the hourly rent mode there is a separate calendar for one day divided into 5, 10, 15, 30 or 60 minutes. Booked days are highlighted with pink color. For each free day, the room rate is given with regard to seasonal prices. To book a room you need to create an order for this room while specifying the term and the type of a rent. 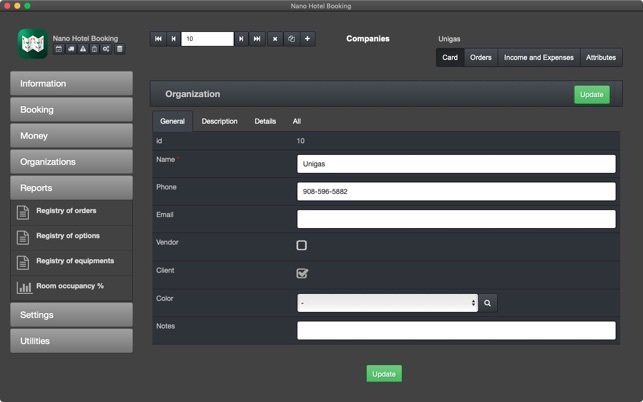 An order can be tied to the client book, or you can simply enter client’s name and phone number directly to the order card. You can book a free room straightforward from the calendar. 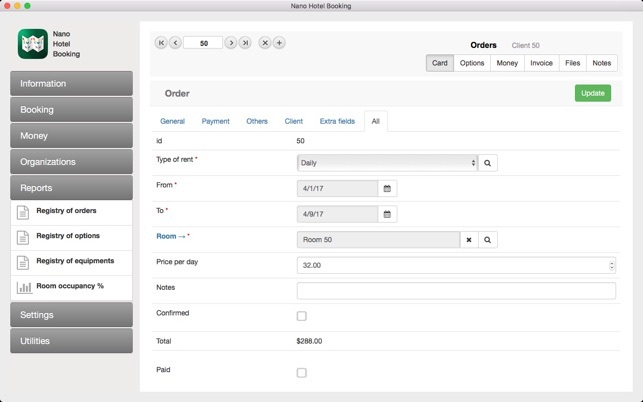 You can open an order card or a room card from the calendar with one click. Rooms can be made unavailable, for example, for the period of renovation. 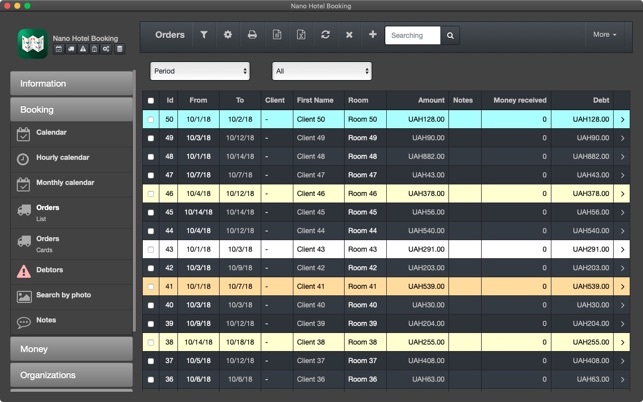 Rooms and orders can also be labeled with colored tags in order to show their current status. In a room (object) card you can specify the price and the cost of one day of rent. If you have a lot of rooms, it will be more convenient to create price lists in the settings and tie rooms to them. You can specify daily, hourly, weekly, monthly, quarterly and yearly prices in the price lists separately. You can enter season prices for each room. Season prices can be tied to the price lists. It is possible to add additional options to each order, such as food, excursions, transfers. There is an indication of each option’s price, as well as whether the price depends on the number of days and the number of guests. An account of the room appliances is kept, i.e. refrigerator, TV, telephone set and so forth. 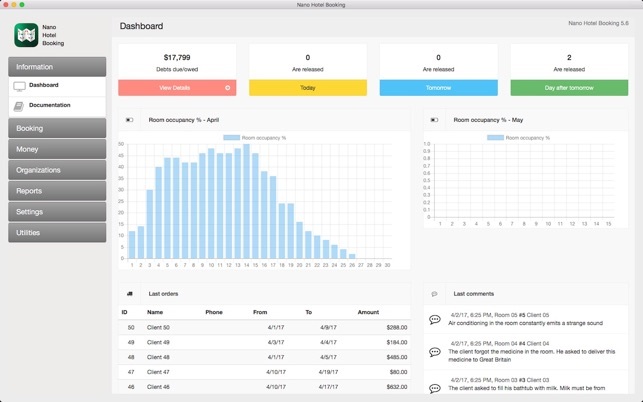 This is the main mode of the application. The value of an order is calculated as the price per day multiplied by the number of days or nights, depending on the application settings (see “Settings” – “My Profile”). The value of an order is calculated as the price per hour multiplied by the number of hours of rent (can be specified accurately to within 5 minutes). In these modes (cyclic orders), the value is calculated as the price per one period (week, month, quarter or year) multiplied by the number of periods that have begun. Let us demonstrate you this through an example. Let’s say the monthly rent is 100 and let’s say today is June 30th. Let’s create an order from July 1st to August 31st with a monthly rent type. In this example, the order amount on June 30th will be 0, as the rent starts only since tomorrow. The order amount on July 1st will be 100. On August 1st the order amount will increase by 100 and will equal 200. On September 1st the amount will not change, as the order ends on August 31st. You can stop a cyclic order at any moment. For this purpose, there is a button “Close cyclic order” in an order card. It will set the order amount equal to the sum of money actually received and the end date to the day of an order closure. In all types of rent, the value of options is added to the order amount. Using this app has made my life much easier. 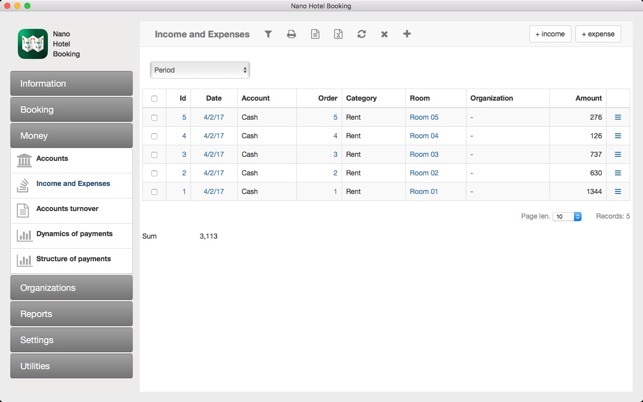 The app is highly customizable and I have found it can fit into any of my booking senarios. 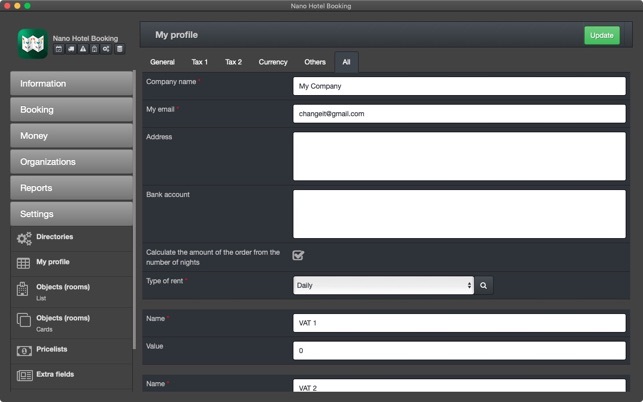 The best thing I've found is that custom data fields can be added into the booking process that add additonal value to the functionaliy of the app for my use. The app author has been extremely helpful in helping me set up the app for my specific use. Great job to the developer, can't say enough, Thanks. This app is not good. You can’t change basic things like prices per week or month, only per day. The calendar view is horrible, you can only see a partial month and therefore you have to use arrow back and forward, there’s no time for check in and out, you can’t book a person arriving and leaving on the same day. Terrible. 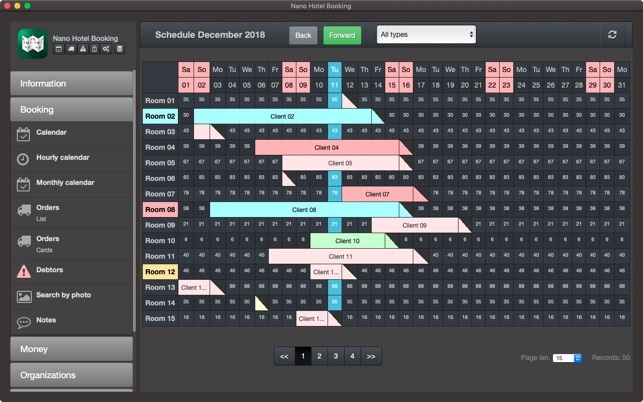 First and foremost, I have been in the Hospitality industry for over 32 years, so I naturally was very sceptical about this little piece of software. I first downloaded it for my iPad for a few $ (all the other “similar” apps were based on more professional systems asking for either a monthly fee or a % of the sale - which as a small 5 unit Vacation renter i am no prepared to do. From there, I was so amazed from what I could do from my ipad that I decided to download it for my Mac. And I still keep being amazed as the Backup from my iPad was imported very easely to my Mac. Of course, it’s not perfect but you can definitly do what you need to have done if you have Vacation rental units to manage. Awesome Calendar. See at a glance whats booked, and what’s still available. Full month view, even on iPad. Nice touch: Calendar shows going rates for each days. Seasons: Possibility to create diffrent seasons, fair days, Holidays etc. The feature that I would like to see beyong all features is a CHECK-IN / CHECK-OUT out section along with a robust DEPOSIT feature linked to eventual damages at CHECK-OUT. - ORDER section: Change the “FROM” “TO” by “IN” and “OUT”. - Have the possibility to enter the number of nights that client is requesting. (in that case, the OUT date should be calculated automatically). - INVOICE section: Unit price should be based on the “TYPE OF RENT”: Daily, Hourly, Monthly etc. RATE. - INVOICE section: Description should also list the ROOM booked. - SEASONS (PriceLists): Need a way to copy several SEASONS across several Units/Apartments. - COLORS: Possibility to create more Colors. Anyway: Excellent work from the programming team who definitly went above and beyond the call of programming to really understand the concept of Vacation Rental Management.